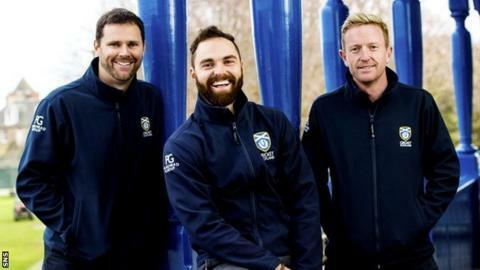 Paul Collingwood says he harbours no divided loyalties as Scotland prepare to take on England this Sunday. The teams meet in Christchurch in a Pool A World Cup fixture and the ex-England captain will take his place among the Scottish coaching staff. Collingwood will work alongside head coach Grant Bradburn, having assumed a support role during the tournament's qualifying rounds last year. "It's not too weird at all," the 38-year-old said of the match. "When you get involved with a team and go through the emotions with a team and get to know the players, you're desperate for them to do well. "Being involved with the World Cup qualifiers last year, the highs and lows of it, winning the tournament to get to the World Cup, it won't feel weird at all. "Of course, when you hear the national anthems going on, and the guys are singing that, I'm used to doing it with an England shirt on. "But once that's over and we get into the game, I know 100% I'll be desperate for Scotland to do well." Collingwood, who has a five-week contract, revealed the players have little mercy for his heritage when it comes to celebratory renditions of Flower of Scotland - on- and off-field staff, he said, are united in their quest for a maiden World Cup victory. "I had to learn the words," he laughed. "I was forced into it, because every game that they win they sing the national anthem and get in together in a huddle and sing it as loud as they can. "I get in the huddle and they make me sing it, and they always look at me when 'proud Edward's army' comes out. "But we do it in a real manly, boisterous way. They sing it really loud and passionately which is great. "We just want our first World Cup win - we're desperate to do that and I honestly think we're going to get it during this World Cup and hopefully that'll come in Christchurch. "I honestly think we can score enough runs to win the game against England. I'm not going to say 300, but enough runs to put them under pressure. I know as an England side going in against associate teams, there are a lot of nerves around. "There's a lot of pressure on you, because you know they're a potential banana skin, and I guess you know the consequences and ramifications if you don't win a game like that."